Especially in projects where there’s no outside implementation partner, organizational alignment is key because your organization will be responsible for the whole solution. Both local team and leadership needs to be fully on-board, with top management regularly reviewing progress and local teams devoting significant time to automating processes getting help from departments like Strategy. Adjacent teams that rely on automated processes also need to be notified and convinced in advance and especially in the beginning of automation they should be on the lookout for any issues. These are not only implementation related issues. Once the RPA solution is rolled-out, it will require maintenance as processes are changed to make them more efficient, effective or compliant with new regulation. Satisfying these maintenance needs are important and can be challenging if companies do not dedicate enough resources and management attention or if they do not clarify responsibilities. Additionally, IT can act as a coordinator in these tech purchase decision by other units. If there’s already an RPA implementation in the enterprise, IT should bring both things together and help them learn from one another’s experiences. Shadow IT which leads to different divisions using a myriad of tools leads to sub-optimal IT costs and data silos. Data/analytics is on most senior leaders’ agendas and bots have the potential to create significant amounts of data. If analytics function is involved early on, the format, frequency and other important decisions about the data created by bots can be considered early on. This leads to bots creating valuable data as opposed to simple diagnostic information which is the case in most bot installations. However, benefits of RPA to analytics should not be too exaggerated as we explained before. HR is important to get aligned with or else RPA training programs may never take their place in the corporate training schedule. RPA training is important to reduce reliance on RPA consultants and empower employees. Business impact is key to excite the organization. RPA project on a process with low business impact will have little momentum. Processes with high business impact tend to be high volume, high effort processes that touch the customer. Nothing like telling a CEO we can approve loans in 2 minutes rather than 2 days. Process should not rely on ill-defined, high-level cognitive tasks. Reading an email that explains a number of tasks which include communicating with a client and reviewing an advertising image are quite simple tasks for a marketing professional. However, currently these are not well defined tasks and are therefore not suited for automation. For example, it’s difficult to explain what makes a good advertising image. This does not mean that such automation programs are impossible. An automated system could use crowd-sourcing to pick right advertising but it would be costly, slow and hard to program which are not the right qualities in good automation software projects. Process complexity is a separate issue from high-level cognitive tasks. A process can involve only low level cognitive tasks like adding numbers, copy pasting and so on. However, based on different input, different set of instructions may need to be executed. For example, depending on a user’s answer to a question, a different department may need to handle the user’s request through a different process. Such a process can be complex and it would be difficult to extract the correct process flows in different scenarios. Currently it requires a lot of manual process data extraction, interviews and lengthy pilots to successfully automate such processes. However, this is an ongoing area of research for RPA vendors and startups which aim to auto extract process data from logs and videos to successfully automate complex processes. We call these self-learning automation solutions. Newer solutions called cognitive automation or intelligent automation (depending on the company promoting the solution) are able to watch as automatable work is performed by humans, learn the automation needed and takeover when ready. We are investigating such innovative solutions and listing them as they become available. Custom solutions tend to outperform generic solutions and RPA is a very generic solution. For example, Anant Kale from AppZen recently mentioned how some companies are trying to use RPA for expense audits. I think that’s a great example for a process where a high quality custom solution exists. 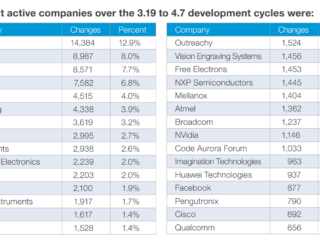 No RPA solution will be able to go into as much depth as AppZen can over an expense item. AppZen has a database of fraud patterns and built a knowledge layer of where and how people spend for travel and entertainment (T&E). An RPA solution will not have access to any of that data and will likely perform poorly compared to a custom expense auditing solution. However, managing multiple solutions brings new IT complexities so better make sure that the new custom solution is worth the effort of migration. RPA is not the only mode of automation. Replacing legacy systems or building powerful API interfaces to legacy systems can help you automate numerous processes with less effort than building RPA solutions. Because RPA systems use imperfect screen scraping solutions, upgrading legacy systems offer faster and more accurate automation solutions. The first process to be automated will likely be selected with a robust process. If that automation delivers significant value, all senior managers will be excited to jump aboard and start automating their processes. This can lead to a loss of focus as RPA experts are stretched thin due to demands from varying departments. Automation of less critical processes will deliver less value than initial pilot and this can lead to an “automation-fatigue”. Though numerous departments spent significant effort to automate processes, they will end up with little improvement. Many processes are 70-80% automatable without great difficulty. However, as the level of automation increases, businesses face diminishing returns. Automating a process completely may be five times more expensive than automating a process up to 80% because that additional 20% will require automation code that’s a lot more complicated than the code required to automate up to 80%. Process redesign, keeping human in the loop for edge cases are all solutions to operate 80% automated processes with optimal efficiency. Bankers, especially those on the technical side, like to boast how they are actually running tech companies and using the state of the art. However when we start discussing how they implement RPA solutions, some have not even heard about self-learning or low code/no code solutions. We discussed self learning solutions above, another interesting new area is no code RPA solutions. 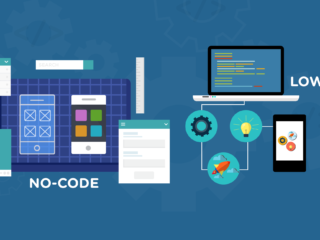 While normal RPA solutions require intensive programming, no code RPA solutions replace time consuming coding with recording and drag and drop interfaces which aim to democratize RPA. Especially when you are outsourcing your RPA setup to a consultant or BPO, keep in mind that they may have a conflict of interest. Programmable solutions take longer to implement and therefore result in longer billable hours, however such programming may not be needed if cognitive automation is used. Scalability is widely quoted as a major issue especially for Fortune 500 organizations looking to scale up their RPA implementations. Managing an RPA installation involves starting and stopping bots due to business necessities, managing the maintenance process, ensuring that error rate is acceptable. RPA management should also demand very low time commitment to ensure that RPA’s benefits are optimized. 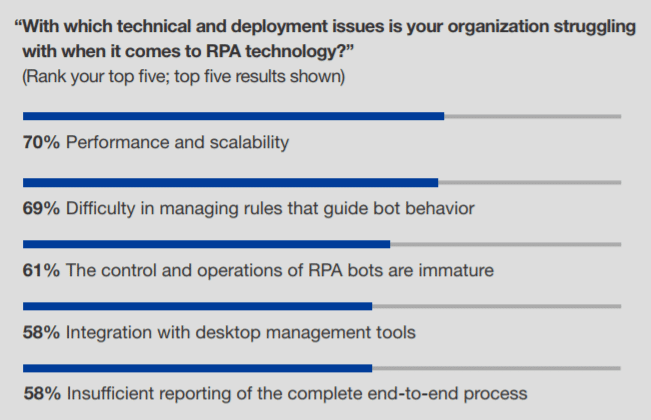 Complexity of managing an RPA installation can grow quickly as number of bots, issues encountered by bots and processes impacted by bots grow. Ensuring that bots are audited post implementation, simplifying bot architectures and following a gradual approach to automation can help facilitate management of RPA installations. Given increasingly large RPA installations, it seems that vendors are effectively tackling this problem. For example, UiPath in partnership with IBM, Accenture, EY and PwC rolled out RPA bots in Sumitomo Mitsui Financial Group to automate activities in 200 processes leading to 400K hours of annualized savings. 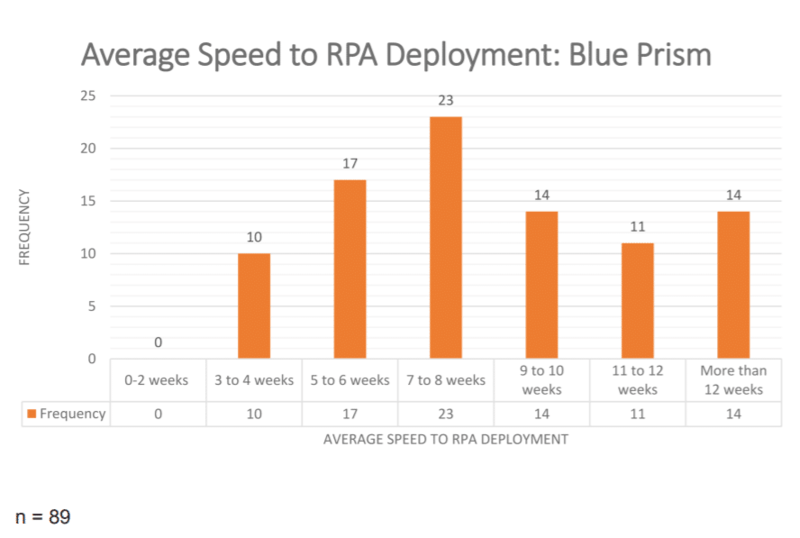 400K hours/year is approximately worth 250 FTEs making this one of the largest RPA deployments globally. Maintenance is the most important post-implementation challenge. Changes in the regulatory or business environment will sooner or later require changes to bots. Since most bots are programmed, following software best practices in programming allows bots to be maintained with relative ease. Still, changes need to be prioritized and necessary effort needs to be devoted to bot maintenance. RPA essentially adds a new responsibility to process owners. While they will likely be managing a smaller workforce that produces higher quality results, they will need to allocate time to manage and maintain their bots. We do not have access to the free text responses but the first issue definitely highlights the implementation problems these firms are facing. Scaling RPA solutions require effort and companies are probably having difficult time dedicating personnel to automation efforts while they need to ensure the smooth functioning of their business. 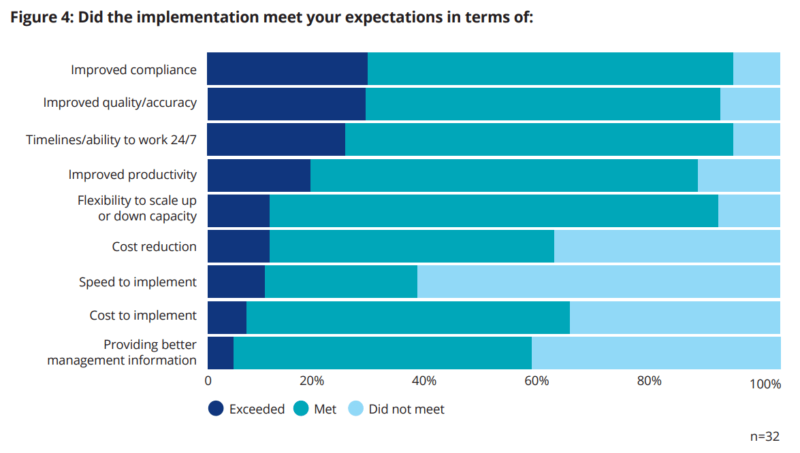 And scaling automation with consultants may not be economically viable for processes that are not among the most valuable and frequent processes of the company. So far these have been the cases I frequently heard from the trenches. Will keep on updating as we hear more implementation stories. Please leave a comment if you have other stories. We leveraged existing papers on the issue like this one by UiPath. In order to implement RPA “the smart way” and take the most advantage of it, companies should be aware of robotic process automation pitfalls from the very beginning. According to an article from Forbes, more than half of technological failures are in fact due to poor management, and only 3% are caused by technical problems. Difficulties may also arise from not choosing the right processes to automate. Thanks for the Uipth Training information provided to me.